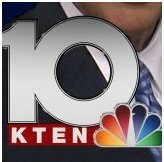 News TV Channel / KTEN, virtual channel 10 (UHF digital channel 26), is an NBC-affiliated television station serving the Ada–Sherman media market that is licensed to Ada, Oklahoma, United States. The station – which also maintains subchannel-only affiliations with The CW and ABC – is owned by the Lockwood Broadcast Group. KTEN maintains primary studio facilities located on High Point Circle (near Katy Memorial Expressway/U.S. Route 75) in northwestern Denison, Texas; secondary studios are located at the Ardmore Energy Center on Merrick Drive (near North Commerce Street) in northwestern Ardmore, and its advertising sales offices are located at the intersection of East Main Street and Rennie Avenue (near the offices of the Ada Evening News) in downtown Ada, Oklahoma. The station maintains transmitter facilities located along State Highway 7 in rural northeastern Johnston County, Oklahoma (west of Wapanucka and southwest of Bromide).